Talk to Simba in the Oasis of Pride Lands. 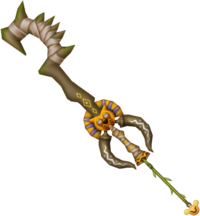 The Circle of Life is a Keychain for Sora's Keyblade that appears in Kingdom Hearts II. The handguard of the Circle of Life is comprised of two large fangs that curve downward and do not connect to the pommel of the handle. The rainguard and Keychain are both lion heads, specifically the head of Simba as drawn by Rafiki in The Lion King movie. The blade is a short wooden shaft that extends upwards a little, then curves into a backwards C-shape. The C-shape is wrapped in white cloth strips and wooden spikes protrude from the wrappings, which serve as the teeth of the key. The chain of the Keychain seems to be a vine, rather than metal links. Circle of Life is one of the Keyblades packaged with the Series 1 Play Arts Figures Master Form figure. This page was last edited on 8 August 2016, at 09:23.